Leading off today: Cornwall football coach Mike Connolly resigned as both coach and as a physical education teacher at the school Friday just hours before the state's third-ranked Class A team was scheduled to play, Hudson Valley Sports Report disclosed. Connolly was in his fifth year as a teacher and coach at Cornwall, the seven-time defending Section 9 champion. The Dragons are scheduled to play at Hyde Park FDR on Friday with offensive coordinator Eric Holzapple taking over as head coach. The specific reason for Connolly's departure is unknown. He told The Times Herald-Record it was a personal decision arrived at with his wife, adding "I knew probably two days ago." HVSR reported a special board of education meeting was called for 11 a.m. Friday morning, but it was unknown if the meeting was related to Connolly, who had a 42-7 record at Cornwall. Milestone: Central Valley Academy junior Reilly Rich scored four goals to reach 103 for her career as the Thunder earned a 6-0 win over Camden. Rich is in her fifth varsity season. She has 19 goals in CVA's 9-2-1 start to the current season. Helping one of our own: A GoFundMe campaign on behalf of Nancy Haggerty, a reporter with The Journal News, raced past the $20,000 mark early Friday as friends and Section 1 high school sports fans showed support after a fire severely damaged her home on Tuesday. At least one of her cats perished in the blaze and other pets could not immediately be accounted for. Numerous Lower Hudson Valley teams and coaches were among those who contributed to the GoFundMe campaign in its first 36 hours as word of the tragedy circulated. NFA makes a change: Former Newburgh Free Academy boys basketball coach Frank Dinnocenzio is being recommended to the board of education to return to lead the program. The vote could take place Tuesday. Superintendent Roberto Padilla told The Times Herald-Record he will support a district hiring committee's decision to select Frank Dinnocenzio, who was the head coach during the school's class-cutting scandal during the 2008-09 and 2009-10 seasons, as the top candidate of three applicants, including incumbent coach Matt Brown. Dinnocenzio has denied knowing about his players skipping school. decided against returning him to coach the boys basketball team for the 2011-12 season. Brown, who has coached NFA for seven seasons, issued a statement that said in part, "[I]t seems no matter how hard I work to push this program in the right direction my efforts will never be appreciated." Postponed: Schal- mont's football game scheduled for Friday against Hudson was postponed after cases of Coxsackievirus were confirmed at the high school and middle school. Schalmont AD Matt Ronca said three players had contracted the virus, which causes flu-like symptoms that subside without treatment. Schalmont workers disinfected buildings and equipment after the cases were confirmed. No make-up date has been made for the game between Schalmont and Hudson. Two other recent games were postponed due to the same virus. The Gloversville at Ballston Spa game was played Sept. 10. The Amsterdam at Broadalbin-Perth game has yet to be made up. 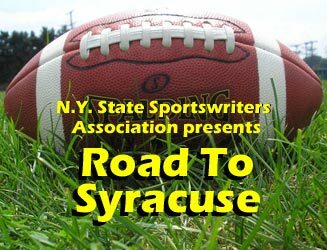 More football: Twenty games on the Week 6 schedule are head-to-head skirmishes between teams ranked this week by the New York State Sportswriters association.